Reports are generated by clicking on Actions -> Generate Reports. ProSET®’s report generation function allows you to produce reports for SIL Determination (both LOPA and Risk Graph), SIL Verification, SIL Assessment (combined report of SIL Determination and SIL Verification), Safety Requirement Specification and PHA (full report and Actions only report). 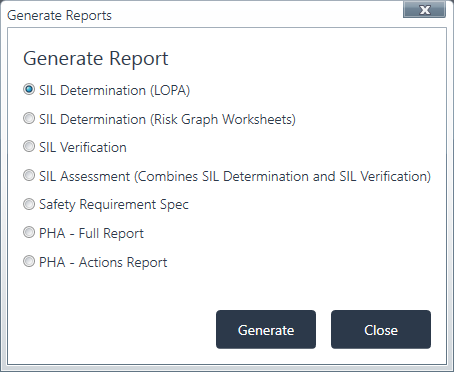 Select the report that you would like to generate and click Generate. Please note that report generation is not available for Trial Users. On purchase of ProSET you will access to the Default Report Templates in your Downloads area. Report Templates should be saved in a folder entitled “ProSET” in your My Documents folder (e.g. C:\Users\j.bloggs\Documents\ProSET), see ProSET® Installation for more guidance. Bookmarks are embedded in the reports to be replaced with ProSET® generated content, whilst Placeholders can be used anywhere in the Report Templates to add project specific titles. If you are unfamiliar with bookmarks in Word please refer to the following guide on the Microsoft Support site: Add or Delete Bookmarks. Defined below are the bookmarks which are available for use in each of the report templates.